In my last post about my wedding day makeup, I told you that I was thinking of canceling Shirley Wu for my wedding day…which I still am (mainly due to the fact that she won’t travel) however, before I officially do so I need to find another MUA! Tonight I did a trial with Gargi Patel. Her sister created Vasanti Cosmetics, a make-up line which was originally designed for South Asian skin tones, and so she only uses Vasanti products as she’s the company’s head make-up artist. She also has her own company called Ginger Beauty and has done make-up for celebrities such as Lisa Ray and Hannah Simone. 1. I felt as though there was nothing special to her eye shadow application. I feel like the art of makeup is really in the application of the eyeshadow, liner, mascara…where to apply darker shades, lighter shades, where to blend, how to line so that the eyes look bigger, how to get the best lash curl, how to apply lashes so they look flattering…this is what I think requires skill and a honed technique. I was disappointed with the eye makeup that Gargi did. I felt as though the shadow was very one dimensional and that the eyeliner was messy. What really did not impress me: she didn’t line the top eyelid…so you could see some mascara marks on the lid but it wasn’t fully coloured in black, which I think is a commonly known trick to make your eyes look bigger. Also, she didn’t fill in my eyebrows evenly. 2. I asked for a matte red lip. A red lip is hard to do. It requires particular skill in lining so that it doesn’t bleed and an evenness of application. Hers wasn’t. 3. I realized that the quality of Vasanti products is poor. The makeup airbrush application started cracking and showing lines within an hour (which she tried to say was my face’s natural lines – it’s not, it’s the crappy product) and the eye shadow colour palettes look cheap. Besides, makeup is not one of those things that is one size fits all. Some brands are known for their concealers; others their blushes. All one brand is not the way to go, in my opinion. 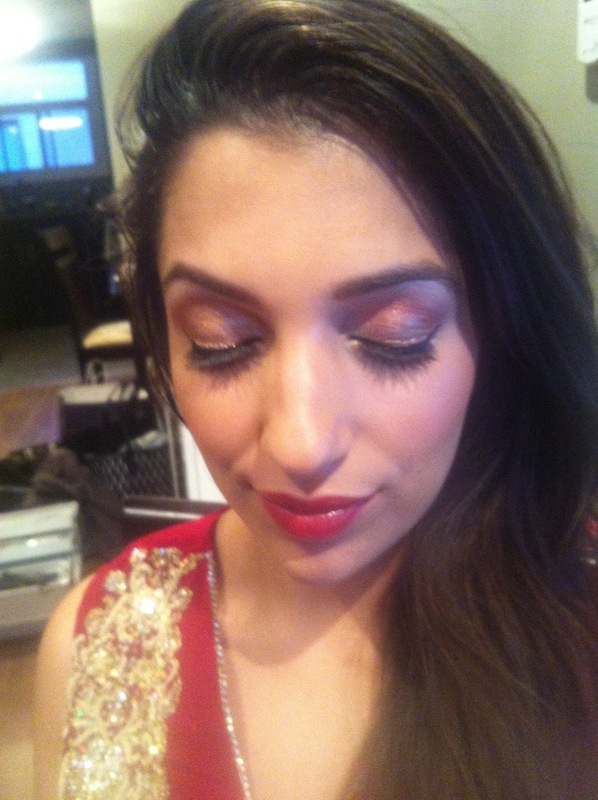 In this pic from my trial (which cost $150 btw – ridiculous) I don’t think you will be able to tell all of the things I described, but I would definitely say there is not really a wow factor to her makeup. You go to a makeup artist because you want a polished application, I felt like it was just OK – wouldn’t recommend! Hey why dont you look into these two artists ive personally seen brides by them and they do a good job they both have facebook pages 416-992-0626 http://www.noorartistry.com and 647.668.6815 http://amplifiedsoul.com good luck..! Hey Dania, thanks for the suggestions! Noor artistry is actually booked for my day, unfortunately, and i did a trial with amplified soul and I just wasn’t in love with it…also I think I’m very picky!! But makeup is a very personal/subjective thing like that I guess!